Greek Wines under P.D.O and P.G.I. The first wine cooperatives were developed in 1930. They played a positive role in maintaining and developing the vines and the wines in the traditional areas currently producing wines with Protected Designation of Origin (PDO) and Protected Geographical Indication (PGI). In the 70s, the Greek market of bottled wine was very limited, since there were only 4 companies prevailing, other than wine cooperatives that existed. However, the greatest development took place in the 1980s, when emphasis was given in the cultivation of vineyards and the use of proper expertise by highly skilled professionals. At the same time, modernly equipped wineries were founded, setting the standards for the production of high quality wines. Moreover, the terms of Vin de Qualité Produit dans une Région Déterminée (VQPRD) and Appellation d’Origine Contrôlée (AOC) were established, according to edicts of 1971 and 1972, thus defining the wines particular characteristics. Over years, these terms were evolved either due to reconsideration of the characteristics of certain regions or due to their recent reform from VQPRD to PDO (Protected Designation of Origin) and AOC to PGI (Protected Geographical Indication). Although the decade of 1970 was considered the beginning of a new era, single variety wines (monovarietal) were not popular, since each region consumers knew just the varieties of their region. Gradually and as single variety wines begun to appear, there was noticed a dissemination of several grape varieties to a wider range of consumers and as expected, to winemakers and vine growers. 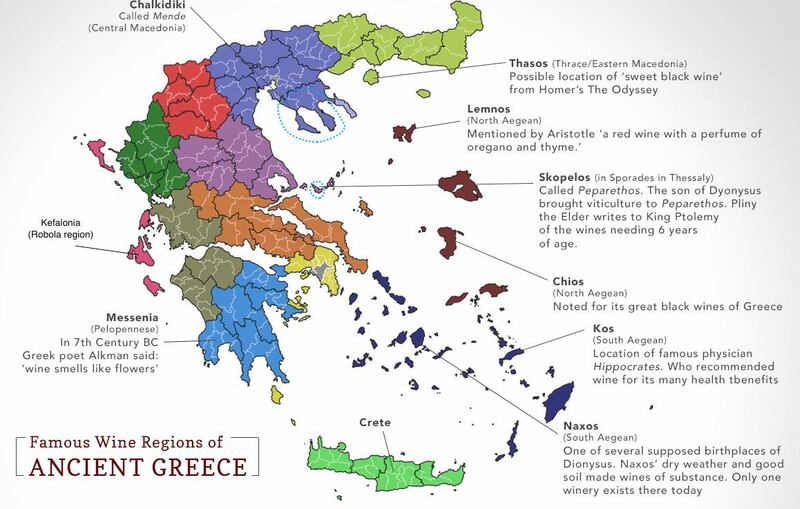 The Greek varieties initially cultivated by the winemakers were: Moschofilero, Roditis, Savvatiano, Xinomavro and Agiorgitiko and the International ones: Chardonnay and Cabernet Sauvignon. In the decades of 80s and 90s, the blends of local and international varieties first appeared and over years, the native, indigenous varieties gained ground in domestic and international markets. This was not only due to the uniqueness and the Greek character (“terroir”) but also due to the impressive, large number of Greek varieties. There are claims that the domestic varieties exceed 350, while in some countries there are no native grape varieties for wine making. To be more precise, this number is more likely to be close to 200, since some of them appear with a different name in some regions and even different vine characteristics. In any case, few of them are widely known and largely cultivated for the production of high quality wines. Among them, Aidani, Assyrtiko, Athiri, Vilana, Thrapsathiri, Debina, Lagorthi, Kydonitsa, Malagousia, Monemvasia, Moschofilero, Muscat of Alexandria, White Muscat, Plyto, Robola, Roditis and Savvatiano are the most reputed white varieties and the red ones: Agiorgitiko, Vertzami, Kotsifali, Liatiko, Limnio, Mandilaria, Mavrodaphne, Mavrotragano, Negkoska and Xinomavro. Meanwhile, on certain soils, there was noticed an excellent adaptation of some international varieties such as: Chardonnay, Gewurztraminer, Riesling, Viognier, Semillon, Sauvignon blanc, Ugni blanc, Cabernet sauvignon, Cabernet franc, Merlot, Syrah, Mourverdre, Grenache rouge, Refosco, Carignan, Petit Verdot, Primitivo, Sangiovese, Nebbiolo, Tempranillo, Pinot Noir. Nowadays, things are different since each one of the wine producing regions of our country possesses its own microclimate and remarkable, promising wines are produced by indigenous varieties. The wider area of Macedonia, Peloponnese, Epirus, Central Greece, the Aegean Islands, Crete, Thessaly, as well as a large part of the Ionian Islands, the Dodecanese, the islands of the northern Aegean and Thrace, have large expanses of vineyards, producing high quality wines that thrive in Greece and abroad have already begun their recognition, all over the world. The wine produced in Greece is a key component of the Mediterranean diet, the nutritional benefits of which have been recognized worldwide.